Alissa Danckaert-Skovira is a lifelong Akron resident who shares today’s guest article about the unique reuse of a church in Akron. Growing up in a financially comfortable family, Zac began to notice systemic injustice when he volunteered at summer camps at his church. Economic instability, racism, neighborhood blight, and a host of other social ills made a deep impression upon him. Though he went on to college and graduated from The University of Akron with a degree in Marketing Management, he continued to be drawn to the idea of making a difference with his life. When it came time for him to purchase his own home, Zac found a dilapidated house near his church in Middlebury, part of Ward 6 in Akron. He and his wife Beth devoted themselves to reclaiming the house. The problem was that Zac didn’t know much about rehabbing a house. “A friend of mine worked in construction, and I learned a lot from him,” he admitted with a rueful grin. It was the start of quite an education, but Middlebury, with its diverse population, appealed to him and Beth. Hundreds of people drive through or by Middlebury daily, never suspecting that the area was the first settlement in what went on to become Akron. No historic markers note its significance. Joseph Hart, a seaman from Connecticut with a vision, decided it was the perfect spot for a mill in 1804. The township of Middlebury flourished for a time, and the First Presbyterian Church was founded. Construction on the Ohio and Erie Canal brought more wealth into the region, but the canal that had been planned for Middlebury instead was placed in Akron due to the influence of men like Simon Perkins. Upon its completion, the canal bolstered up the city of Akron, and Middlebury lost its prominence. Periods of boom and bust followed. The handsome First Presbyterian Church became an island surrounded by a sea of decaying neighborhoods. Eventually, its congregation relocated, leaving behind a large church with glimmers of its former beauty in its vaulted ceilings and stained-glass windows. The church building went on the market, but who would want to buy it? Perhaps working as a pastor by day and rehabbing by night, not only his own home, but other houses on his block as well wasn’t enough of a challenge for Zac. As the executive director of the fledgling Well CDC, Zac recognized the building’s vast potential, and the foundation purchased it. Now the Well shelters seven non-profits and a for-profit organization. Among these is Compass Coffee. Roomier than most coffee shops, Compass Coffee embraces the philanthropic spirit with its slogan “Drink coffee. Do Good.” The chic urban coffee house gives off an industrial vibe, a nod to Akron’s bustling manufacturing days, and devotes a portion of its profits to the Middlebury neighborhood. The kitchen within the coffee house is an important part of Zac’s future plans. “One of our creating economy initiatives is turning this into a shared use kitchen for food entrepreneurs,” he said. Though he noted that the space needs renovation before it can become a licensed commercial kitchen, he envisions food bays and a way to bring business and community together. The non-profits sharing some of the rooms in the rest of the church focus on helping disadvantaged members of society. 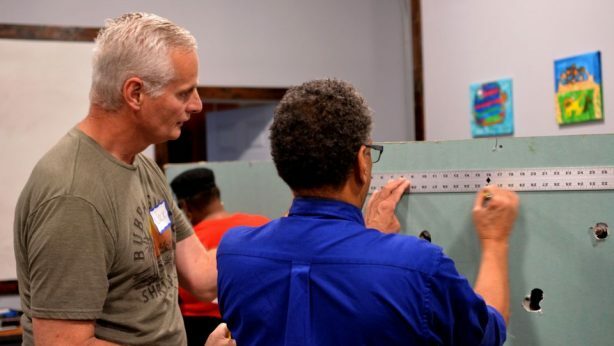 World Relief Akron assists immigrants as they settle in unfamiliar territory. Moving Beyond Hope is an organization that promotes literacy. ASIA Inc. offers health and social services to Asian Americans and Pacific Islanders. All in One helps provide struggling families with household items or clothing. Healing Hearts offers counseling to those in need. Citizens Akron Church, where Zac is one of the pastors, also occupies space in the building along with h2o which is a collection of college churches. All promote the sense of community Zac hopes will foster a full recovery for Middlebury. Various rooms in the old church are being refurbished with the intention of renting the space out to other businesses in the community. By summer’s end, Zac would like to see all of the space rented out. The blend of old and new offers a rare and lovely ambiance. Pews removed from the sanctuary have been repurposed into tables in one of the meeting rooms. The blonde wood stretches into impressive conference room tables with ample seating around it. But as with all old buildings, there comes more than a few expenses. Buyers of such properties know to hope for the best and prepare for the worst. The church has an old elevator that Zac remembers being told would take “sixty to seventy thousand dollars’ worth of work” to get up and running again. They found “an elevator repair company that was really great that fixed it for $1500 dollars. It was a significant savings that was really helpful. “ With the rest, however, the tab has added up quickly. Still, it’s easy to see the beauty in the exquisite detail of the old hardware on the doors in the front of the building and the cherubic faces carved in the stonework. In spring, the front of the church is especially welcoming with fragrant viburnum and flowering dogwood, their white blooms providing soft contrast against the austere red brick. The space outside of the church is being cultivated as well with a greenhouse and a long pergola. A farmer’s market and community garden will draw people from both within and beyond the community. Middlebury Wednesdays start on June 27th, and fall on July 11th and 25th, August 8th and 22nd, and finally, on September 5th. The Well CDC has secured grants from the John S. and James L. Knight Foundation. With its fundraising campaign, it stands to get Middlebury back on its feet. Zac noted that “We’ve already had community members express lots of excitement. We’ve had some great support from different people with a lot of our projects.” Zac, his wife Beth and their three sons call Middlebury home and hope to make it an inviting community for all. Bringing an old church space back to life has been an anchoring part of that. This essay is part of an ongoing engagement with Akron, Ohio, supported by the Knight Foundation. Learn more about it here. 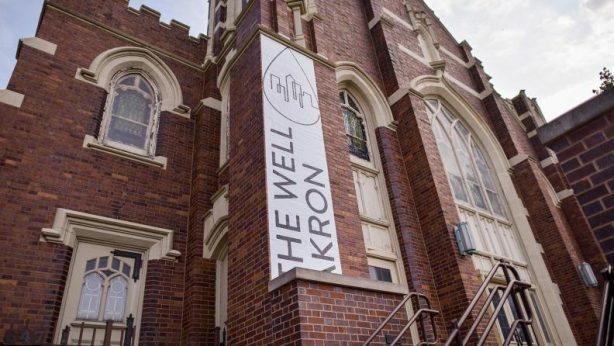 The Well CDC exists to give worth, value, and dignity back to the communities of Akron. When you shop here, you help us serve your community.